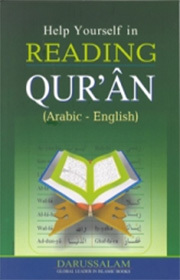 It is a guide for learning to read the Arabic of the Qur’an in a simple way through transliteration without a teacher. After mastering this guide , one will be able to read Qur’an without any difficulty. Insha-Allah. The reading of Qur’ân is of prime importance to a Muslim. Qur’ân was revealed in Arabic language and it should also be read in Arabic only, because the actual meaning of Qur’ân in Arabic can not be expressed in the translation of any language. That is why, it is an established fact that the reading of any translation of Quran does not mean that the actual Quran has been read.